Sushi has been growing in popularity over the past few decades. Many people think it’s a food that can only be eaten at restaurants. This couldn’t be further from the truth. You can and should make sushi at home. 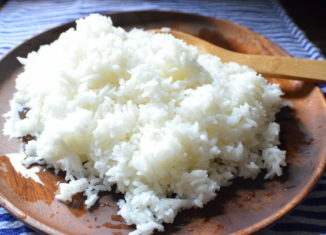 The reason quite a few people don’t is they’re uneasy about making sushi rice at home. You shouldn’t feel nervous about making sushi rice. If you can cook rice, then it’s possible to whip this up before making sushi. The first thing you’re going to want to do is to buy sushi rice. Yes, the rice that’s used in sushi is a special kind. You should be able to find sushi rice at any Asian supermarket. If you don’t have an Asian supermarket in your area, then take a look in the ethnic food aisle at your favorite grocery store. You may get lucky and find it there. The first thing you’re going to want to do is cook your rice. Just cook it like you usually would. In a saucepan add the vinegar, salt, vegetable oil, and sugar. Combine all of this with the sushi rice. You’ll at first notice that the rice is very wet. You need to keep stirring it over medium heat. You’ll notice that at some point the entire mixture becomes less wet. It will soon resemble the rice at your favorite sushi restaurants. Must you use raw fish? The short answer to this question is no. There are many varieties of sushi that have cooked fish in them. Though, raw fish is what has made sushi so popular. You want to make sure that your fish is exceptionally fresh if you’re going to eat it raw. If you have any doubt about the freshness of your fish, then don’t eat it raw. Fish that has not been appropriately handled can easily make you sick if eaten raw. You may consider using cooked fish for your first batch of homemade sushi. It’s going to take you some time to get the hang of rolling the sushi. You’ll also need some seaweed to wrap it in. Though, you could go the route of California sushi. This is where everything is on the outside. There is no need for seaweed for this particular type of sushi. Just think about how much your last trip to the sushi bar cost you. It probably put a sizeable dent in your wallet. Great sushi doesn’t have to be expensive. You can easily make it at home for much less money. The only thing you need to focus on is finding quality sources of fish. This is the only hurdle to making your own sushi. The rest is just a matter of getting the hang of making it at home. You’ll be the talk of the neighborhood once you get your sushi making skills down pat.